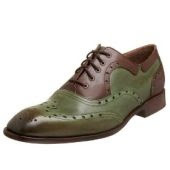 I have to admit that Oxfords shoes represent a classy and timeless choice for dress men shoes. In case you’re bored of the classic black or brown oxfords, you can take a look at the Esquivel footwear collection. The American company is keen to design eye catching shoes with an out of the ordinary color combination. This is the case of these brown and kaki shoes with a gradient mix of colors in the front part of the shoe. Aren’t they something? Really classy and timeless! When it comes to men's shoes they exactly know what to come up with. Thanks for sharing.